Uttarakhand is truly a blessing on this world. Imagine a serene atmosphere filled with lush greenery and crystal blue water bodies. You have successfully imagined one small part of the magnificence of Uttarakhand. The sounds of birds chirping on a bright day whilst the nose take pleasure in the sweet scent of the flowers growing nearby, it truly is paradise. Uttarakhand is famous for housing plenty of places which attract the hearts of everyone. So, stop postponing your trip to heaven and start planning for it. 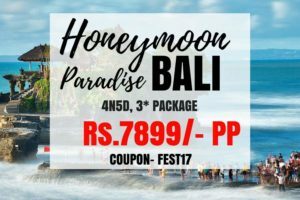 Book your romantic honeymoon to Uttarakhand here. Bhimtal is a small city present in Uttarakhand. The pride of this town is the lake of Bhimtal. Revered for its aesthetic beauty, the lake of Bhimtal sits atop an elevation of 1,370 meters above sea level. The lake is situated at a scenic spot with an island in its center. The view from this island is extremely beautiful. Bhimtal houses amazing natural vistas and it has been blessed with an abundance of nature’s bounty. Learn about butterflies in the butterfly research center. Explore the Nal Damyanti tal. Visit the Hadimba devi temple. Visit the Bhimeshwar Mahadev temple. Frolic at the Bhimtal lake. Dehradun is one the oldest Indian cities. It lies between the foothills of the Himalayan mountain range to the north and the Shivalik mountains to the south. This city is perched at an altitude of 435 meters above sea level and it doubles down as the capital of the state of Uttarakhand. Dehradun is located in the Doon valley nestled between the river Ganges on the east and the river Yamuna on the west.The city is famous for its picturesque landscape and slightly milder climate and provides a gateway to the surrounding region. Visit the guru Ram Rai darbar. Haridwar is an ancient city and it is one of the most important pilgrimage sites for Hindus. It is located in the Haridwar district of Uttarakhand state. The holy river Ganga enters the Indo-Gangetic plane after flowing for 157 kilometers, here in Haridwar. This gave the city its ancient name of Gangadwar, literally meaning ‘The gateway of the Ganga’. Haridwar is regarded as one of the seven most holy places for Hindus. Legend believes that a drop from the elixir of immortality fell on the Har ki Pauri ghat, and since then it is believed as a sacred place. Haridwar presents a kaleidoscope of Indian culture and development. Explore the Chilla wildlife sanctuary. Frolic in the Swami Vivekananda park. Explore the Bhimgoda tank and the legend surrounding it. Mussoorie is a hill station in the Dehradun district in the state of Uttarakhand. It is located at a distance of 35 kilometers from the state capital of Dehradun and at a distance of 290 kilometers from Delhi. It is situated at an altitude of 1,880 meters from the sea level and is located at the foothills of the Garhwal Himalayan range. Perched on a ridge 2 kilometers high, the ‘Queen of Hill Stations’ vies with Nainital as Uttarakhand’s favourite holiday destination. When the mist clears, views of the green Doon Valley and the distant white-capped Himalayan peaks are extraordinary, and in the hot months the cooler temperatures and fresh mountain air make a welcome break from the plains below. Frolic in the Nahat estate. Book your trip to Mussoorie here. Nainital is a popular hill station in the Indian state of Uttarakhand and headquarters of Nainital district in the Kumaon foothills of the outer Himalayas. Situated at an altitude of 2,084 metres above sea level, Nainital is set in a valley containing a mango-shaped lake which is surrounded by mountains. One of the most popular hill stations in Uttarakhand, Nainital is a distinct and a very beautiful place. The town shines as a glittering jewel in the Himalayan region and is surrounded by lakes and nature’s bounty on all the sides. Go bird watching in Kilbury. 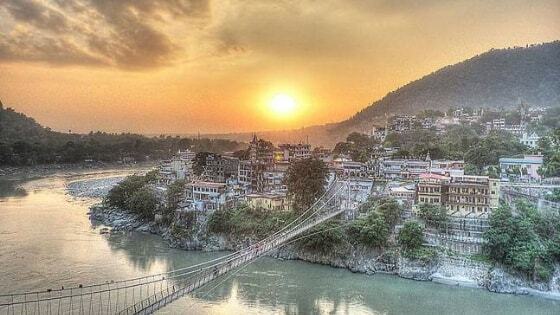 Rishikesh is also called as the “Yoga capital of the world”. Located in the foothills of the Himalayan region, Rishikesh is often referred to as “Gateway to the Garhwal Himalayas”. It is a pilgrimage city and is also one of the most important holy places for the Hindus. The river Ganga; the holy river of India, takes its form near Rishikesh. It is the only destination that is equally popular for Yoga, pilgrimage and adventure sports. The arrival of the rock band, the Beatles, at the ashram of Maharishi Mahesh Yogi in late 1960s gave this quaint town visibility on the world map; and since then the place has grown into a hub for spirituality and yoga. The cackle of the Ganges, whispering of trees amidst the toll of the sacred bells with a backdrop of silver peaks of glaciated Himalayas, makes for a breath-taking environment befitting a spiritual experience. 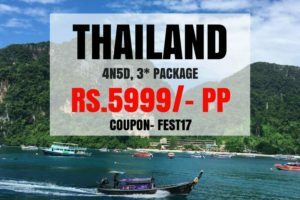 Book your trip to Rishikesh here. Book your adventurous trip to Jim Corbett national park here. Lansdowne is a small cantonment town nestled in the laps of the Himalayas in Uttarakhand. This hill station is situated on the Kotdwar – Pauri road at an attitude of 1,706 meters from the sea level. Described as the gateway to the heavenly abode of Himalayas, Lansdowne is one of the most unusual hill stations in India. Lansdowne is one of the most quietest and the most unspoilt hill stations that has been famous since the time of the British colonial rule. Covered by a thick spread of oak and blue pine forests on all the sides, Lansdowne remains a favorite spot for people who wish to getaway in the serene arms of nature. Mukteshwar is a hill station and a tourist destination. It is seated at an attitude of 2,286 meters in the laps of the Kumaon hills. This town got its name from a Shiva temple situated here by the name of Mukteshwar Dham. This temple is 350 years old and it is a very famous pilgrimage spot. Mukteshwar was developed by the British as a center for research in the year 1893. Mukteshwar is surrounded by thick and dense forests of coniferous trees and fruit orchards. Perched atop a hilltop in the Kumaon region, Mukteshwar offers a 360 degree panoramic view of the majestic Himalayan mountain range. Almora is a beautiful cantonment town located on top of a mountain in Uttarakhand. Almora’s beauty is not confined to a single season and it retains its exotic beauty all throughout the year. This town is famous for its delicious cuisine. It is also known as the capital of Kumaon. Almora is famous among the wildlife lovers. Watch the sunrise and sunset from the hilltop. Gangotri is a famous pilgrimage center revered as one of the Char Dham spots. The river Bhagirathi originates at Gangotri and later acquires the name Ganga when it meets the river Alaknanda. The river is named Bhagirathi after the grandson of King Sagar, Bhagiratha, the one who is credited of bringing the river of Ganga on to the earth. The beauty of the river set in the Gangotri glacier brings forth a mixture of peace and tranquility upon the people who visit it. Badrinath is a spiritual town located in the Garhwal Himalayan ranges along the banks of Alaknanda river at an altitude of 3133 meters. Badrinath is a part of the Char dham and it houses the temple of Badrinath. Nestled in the arms of the mountains ranges of Nar and Narayan, Badrinath is set in the backdrop of the immensely beautiful Neelkanth range. The beautiful hill station of Ranikhet is maintained by the Indian army. It is situated at an altitude of around 1869 meters from the sea level. Ranikhet offers unadulated views of the western Himalayas. Ranikhet is coated with dense forests of pine, oak and deodar trees. These forests provide a natural haven for plenty of animals and birds. Go golfing on the highest golf course in Asia. Frolic around the artificial lake of Bhaludham. Visit the Jhula Devi temple. Kedarnath is a popular pilgrimage destination and it is a part of the Chota char dham pilgrimage circuit. It lies at an altitude of 3584 meters near Chorabari glacier. The river Mandakini originates at Kedarnath. 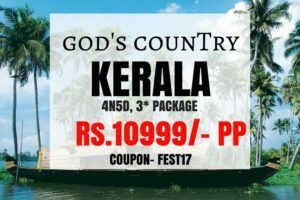 It is flanked by snow clad mountains and lush green forests on both sides offering panoramic views of the entire mountain range. Kedarnath is also the location for the shoot site for the popular Hindi movie which is also named as ‘Kedarnath. Kanatal is a secluded town located near Mussoorie. The sheer beauty of Kanatal is breath-taking. Kanatal offers many adventure sports as well camping facilities to satisfy the adrenaline loving tourists. Kodia forests is located at close proximity to Kanatal. Book your camping trip in Kanatal here.